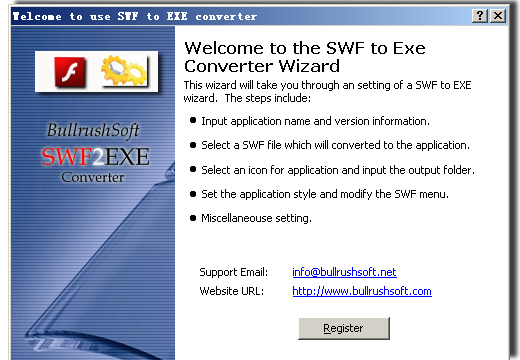 Bullrushsoft SWF to EXE Converter enables the creation of executable files from SWF files. Convert your SWF project, games or presentations into a commercial product. Customize your product informations, protects your SWF copyright.Runing in memory really, no temporary files produced, SWF files more secure. Pack and compress one SWF file with multiple related files. Produce an distributable, read-to-run executabl file. ...... products. You may also easily customize your product's information. Swf to 3GP Converter can convert Flash swf to 3GP, MPEG4 video easily. Convert SWF (Macromedia Flash Movie File) to MP3/WAV quickly and easily. How to convert Flash Swf to MPEG-4 and transfer Swf to iPod easily. Qweas is providing links to BullrushSoft SWF to EXE Converter 1.99g as a courtesy, and makes no representations regarding BullrushSoft SWF to EXE Converter or any other applications or any information related thereto. Any questions, complaints or claims regarding this application BullrushSoft SWF to EXE Converter 1.99g must be directed to the appropriate software vendor. You may click the publisher link of BullrushSoft SWF to EXE Converter on the top of this page to get more details about the vendor.